Blade Condition – Having one blade out of commission or off-kilter can cause your entire blower to operate ineffectively. Whether a blade has come lose or is positioned incorrectly, we’ll work to make sure that your blower blades are working correctly. Flow Capacity – With industrial blowers, you’ll always want to make sure you can maximize flow capacity for the best results. We can do some preliminary testing during blower service to ensure that your machinery is in optimal working condition. Operating Pressure – Similarly, you’ll want your blower to be optimized for operating pressure as well. We’ll determine if you’re in good shape based on the manufacturer’s recommendations and your specific requirements. Port Condition – The design of the port on your blower is important for the connection it makes to your piping or ventilation ductwork. During blower service, we’ll want to make sure your port isn’t damaged or compromised to ensure that you are getting the best results. 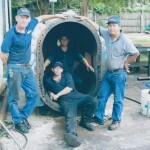 While every blower type is a little bit different, at Pat’s Pump & Blower, we have more than 30 years of experience servicing all makes and models. If you need blower service for your equipment, make us your next call.